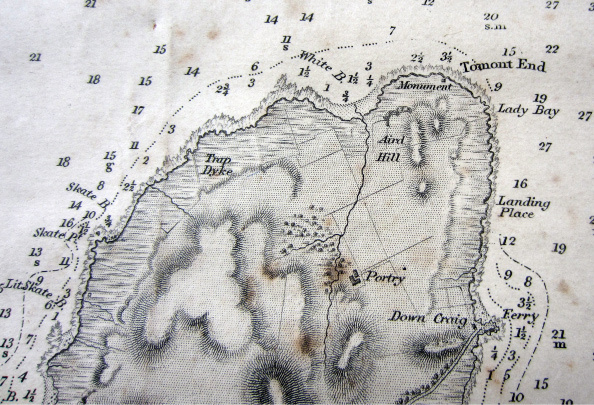 In the summer of 1844 Shearwater under the command of Commander Charles Gepp Robinson was surveying the west coast of Scotland. 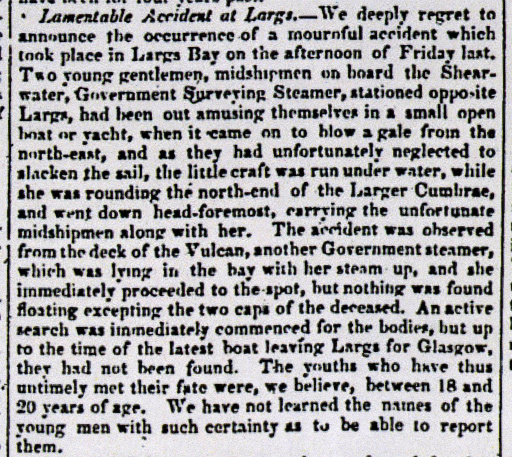 By mid May they had reached Largs Bay and on the afternoon of Friday 17th was at anchor. Two young midshipman friends from the Shearwater, Charles Cayley and William Jewell, borrowed a small sailing boat to amuse themselves. They were out near the north end of Cumbrae when a strong north-east wind caught them and drove their boat bow-first under the waves taking the boys with it. 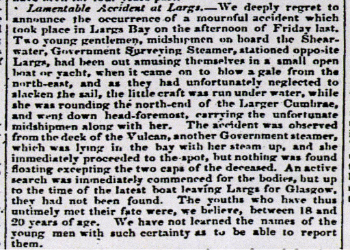 This was observed by the crew of another Government steamer in the bay called Vulcan which, having its steam up, went to the rescue. Unfortunately all they could recover were the boys' caps. There was a thorough search for their bodies but they could not be found. H M S Shearwater was a wooden paddle steamer Royal Navy surveying ship with a displacement of 328 tons. She was constructed in Harwich in 1827 and launched as a Post Office Steam Packet called Dolphin. In 1837 she was acquired by the Royal Navy and commissioned in 1840 at Liverpool as Shearwater. 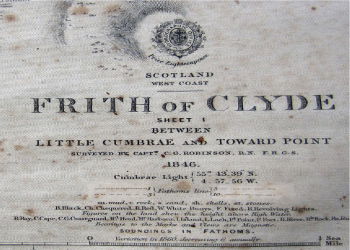 After surveying the coasts of Wales and Scotland she was sold off in 1857. Charles Gepp Robinson was born in 1805 in Devon and joined the navy in 1819. For two years he was stationed in the North Sea. He then sailed the coasts of east and west Africa until 1829 searching for slave ships and indeed managed to capture three. 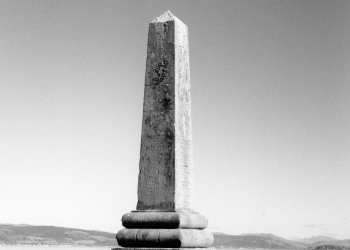 Robinson then joined the Surveying Department working mainly in Scotland, Wales and the Mediterranean until 1856. 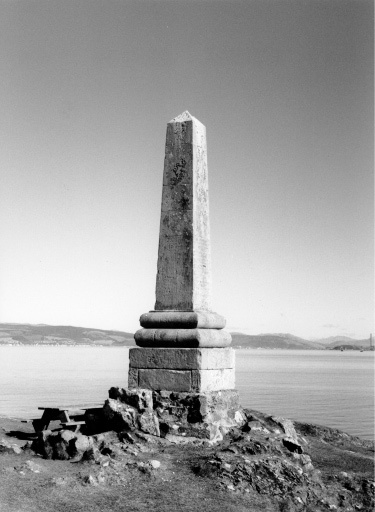 He became a Rear-Admiral in 1864 and Vice-Admiral in 1871 and died in 1875 at his home in Oban.